Mirah Belle introduces unadulterated, pure essential oils that improve the health of your skin, hair and body. These 100% Pure Essential Oils offer a variety of benefits from cosmetic, dietary purposes and are known for their healing effects mentally, physically and emotionally. Mirah Belle's Lemongrass Essential Oil has amazing health benefits and carries strengthening and healing properties. It is suitable to be used on skin and hair. 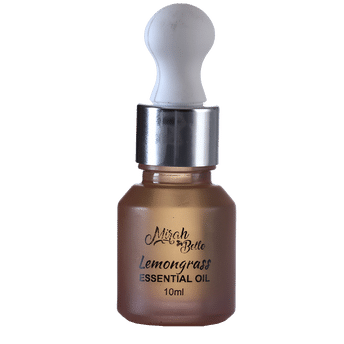 Lemongrass essential oil for the hair: The lemongrass essential oil has the ability to strengthen the hair follicles it contains soothing and bacterial killing properties which leave the hair shiny, fresh and odor free. Lemongrass essential oil for the skin: The lemongrass oil contains healing properties. It is an efficient cleanser for all skin types. It also contains antiseptic and astringent properties which when used regularly gives the skin a natural tone and a glowing skin. It also serves as a natural toner.